Although it has become one of the most hotly contested industries in the world at the minute and is potentially an extremely stressful market for manufacturers to be involved in, consumers should be taking the opportunity to sit back and reap the rewards and device choice that is coming out of the smartphone industry. It’s becoming increasingly difficult to actually keep up with all of the different device launches and announcements, but generally speaking, the large manufacturers like Apple and Samsung make sure their products get noticed. Not wanting to be outdone by Apple who are going to be launching their next-generation iPhone in the coming weeks, as well as the possible introduction of seven other products. Rumor has it that bitter rivals Samsung are also planning on flooding the smartphone market with three new Galaxy handsets that won’t be anywhere near as functional as the new iPhone, but will possibly appeal to the lower-end of the smartphone market. As part of the release, we could see the Korean electronics giants introduce us to a new Galaxy S II Plus handset, as well as a miniature version of the current flagship Galaxy S III smartphone. Additionally, Samsung could be about to introduce a Galaxy Premier device to compliment the range, which will be targeted towards the more budget-orientated market, meaning that the technical specifications of the devices will more than likely leave a lot to be desired. Internet chit chat is suggesting that the company could be building the Galaxy S II Plus handset with a 1GHz CPU and a relatively large 4.3-inch Super AMOLED display. 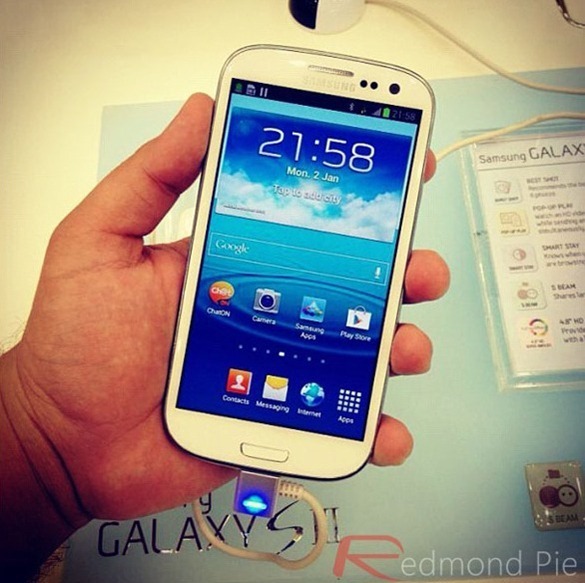 A smaller 4-inch display could be packed into the Galaxy S III Mini device, with the inclusion of a dual-core processor and a fairly decent embedded camera. Potential specifications about the Galaxy Premier are unknown, but it could be the largest of the new devices with a 4.6-inch display and will come with Android 4.1 Jelly Bean installed. With the new iPhone reportedly coming in just a couple of weeks and Apple also rumored to be planning a launch of a miniature iPad soon after, the three new devices from Samsung could be overshadowed by the Cupertino company’s announcements. With that said, there is no time frame for release at the minute from Samsung, so we could be waiting a while for these new handsets.